Located on the 2nd floor, designed with a modern concept with an area of 544 square meters and 4 meters height ceiling. 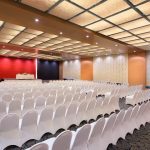 Puri Pertiwi Ballroom is able to accommodate up to 800 persons for a standing reception and 700 persons for a theater style meeting. Puri Pertiwi Ballroom can be divided into two separate rooms, each with wall to ceiling partitions. This ballroom is ideal for corporate annual meetings, conference and conventions, as well as social gathering or receptions.